When Claire Boucher was a neuroscience student in Montréal, she discovered grime music on MySpace, and little was she to know that it would change her life. After listening to many different artists of the genre, it inspired the birth of her identity as the singer/songwriter/producer/director that we now know as Grimes. Hailing from Vancouver, it was while attending McGill university that Grimes began to be influenced by Montréal’s underground music scene and began producing her own form of experimental music. Her unique sound covers many different categories, erring on electronica pop while borrowing synth beats and carrying many R’n’B tones. It is her extensive knowledge of sounds and tones that bring together an eternal sense of unpredictability to her music, keeping fans guessing and sometimes overwhelmed. Grimes’ singles ‘Genesis’ and ‘Oblivion’ from her 2012 album Visions were undeniably her first hits, with our very own Irish company Eircom using ‘Oblivion’ for their television advertising campaigns in 2012. That wasn’t the start of Grimes’ musical career though – that came two years before, in 2010. The release of her first album Geidi Primes in January of that year marked an eerie, tribal beginning to her music. Tracks from Geidi Primes such as ‘Rosa’, ‘Caladan’ and ‘Beast Infection’ showcased her subdued whispery vocals and provided a small glimpse into the dark wonderland Grimes can expose us to. Impressively, Grimes released her second studio album Halfaxa in October of the same year. ‘Halfaxa’ brings a more upbeat tone to Grimes’ collection with dreamy synth and keyboard mixes bringing an ethereal vibe to her music which can still be heard in her music today. Songs such as ‘My Sister Says The Saddest Things’ and ‘Rasik’ show the dark, ominous tone that Grimes’ music is acclaimed for. ‘Devon’ and ‘Dream Fortress’ bring a fairylike quality to the album, with beautiful falsetto and catchiness to the songs ensuring that Grimes cannot be confused with any other artist. The foundations of dark tones and dreamy synth Grimes lays in Geidi Prime and Halifaxa marry flawlessly to produce a significantly stronger, more confident and recognisable sound that is her third album Visions. 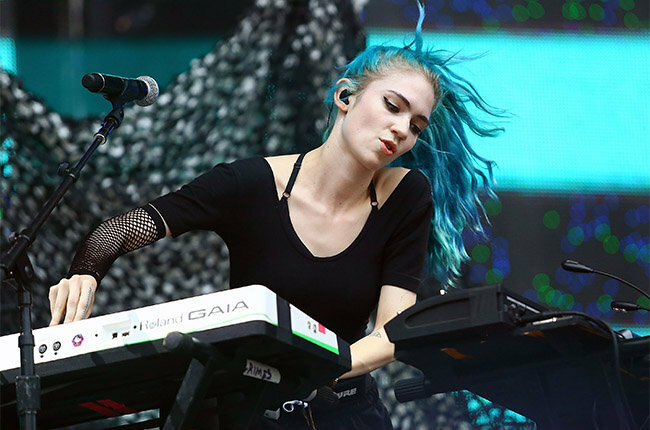 Grimes’ third musical production exploded onto the scene in 2012, kickstarting rapid ascent in the music industry. She earned major recognition at the end of that year when Pitchfork named ‘Oblivion’ Best Song of 2012. The self-directed music videos accompanying ‘Genesis’ and ‘Oblivion’ ensure that the audience remains encapsulated in the weird and wonderful world created by Grimes. Other strong forgotten hits on Visions include ‘Be a Body’ – an ethereal explosion of sounds – and ‘Nightmusic’ – a strange, robotic disco. Without Grimes’ incredible vocal range, it’s apparent these songs would be an incomprehensible mess however she brings a self-assurance that guarantees every song is addictive and unforgettable. 2014 release ‘Go’ – a pop song originally meant for Rihanna – initially disappointed fans, but Grimes bounced back with a bang in 2015, with hotly anticipated album Art Angels. Keeping her experimental roots and synthy reputation intact, Grimes reminds us of the gaping hole she left in the music industry while she was gone and returns with a resounding bang. ‘Venus Fly’ features Janelle Monaé and combines Grimes’ usual synth with drum and bass, creating a phenomenal dance tune. ‘Kill V Maim’ is reminiscent of a supercharged Gwen Stefani, resulting in a quick, fire thrower of a song and ‘World Princess Part 2’ reminds us of the Alice In Wonderland-esque vibes that Grimes provides. ‘REALiTi’ – previously released in demo form – is polished and reworked to create a perfect dreamy pop tune. Fans of Grimes will be able to recognise her new album is a slight deviation from her eerie, haunting roots but Art Angels could well be a strong contender for one of the best albums of the year. Grimes has said she has many musical influences, including Dizzee Rascal, Brooke Candy, Aphex Twin and Nine Inch Nails, and these are on display in her overall sound that is chaotic and cantankerous and not to be messed with. Fans are continuously left bemused by the music of Grimes, but there always seems to be an element of Grimes bemusing herself too. Fans of Gwen Stefani, Karen O and Crystal Castles will adore Grimes, and she plays the Olympia, Dublin on 15th March 2016 – a date absolutely not to be missed. Grimes plays the Olympia Theatre on March 15th. See mcd.ie for more.